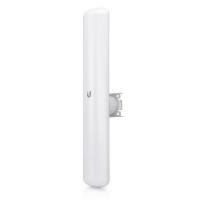 LiteBeam (LBE-5AC-16-120) is compact oudoor AP including 16dBi built-in 120° sector antennas for 5 GHz band. LiteBeam provides maximum throughput for incredible low price. The integrated 2x2 MIMO sector antenna 120° simply covers area to connect client AirMax AC devices. Unlike standard Wi-Fi protocol, the exclusive Ubiquiti airMAX Time Division Multiple Access (TDMA) protocol allows each client to send and receive data using pre-designated time slots managed by an intelligent AP controller. This “time slot” method eliminates hidden node collisions and maximizes airtime efficiency. LiteBeam products deliver superior performance in reduced latency, throughput, and scalability.